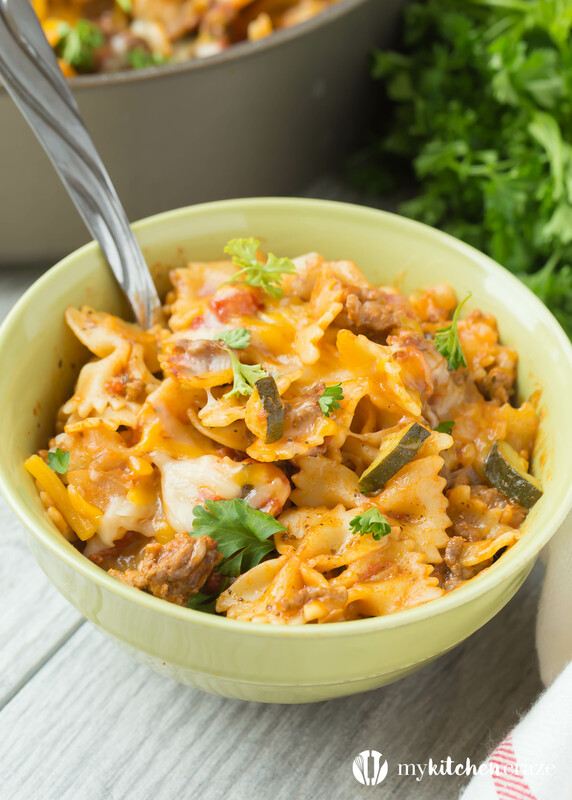 One Pan Italian Pasta will be a winner with your family and it saves time in the kitchen. That’s a win, win in my opinion. I’m always in need of quick meals. Sometimes life gets so busy and you don’t have time to sit, let alone make a meal. I wanted to make a pasta dish that uses only one pan. It also had to have some great flavor and wholesome veggies in it too. Last Saturday, my mom and I went shopping. WOW did we have fun. We haven’t shopped like that in months, maybe even years. It was one of those shopping trips that we had so many bags on your arms that you had to make a few trips to the car. My kids were in desperate need of clothes and, so off we went on a 6 hour trip. It was a blast! We started off the morning with Starbucks, then we went all over. We came up for some air around lunch time and had some delicious Rubio’s. It was an amazing day with my mom and daughter. I loved every second and wouldn’t trade it for the world. 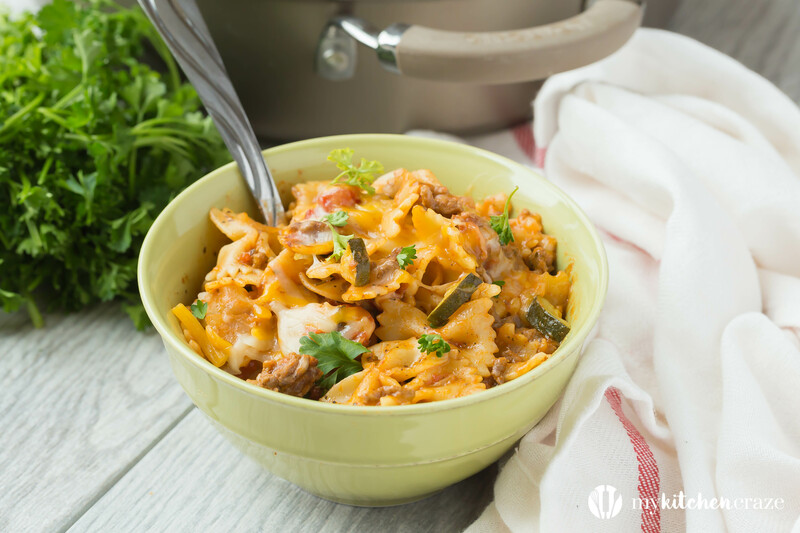 I got all the ingredients out for this pasta, which are easy peasy ingredients that you probably have in your cupboard already. The pasta was cooked within 30 minutes max! Beat that dinner! I was so excited. 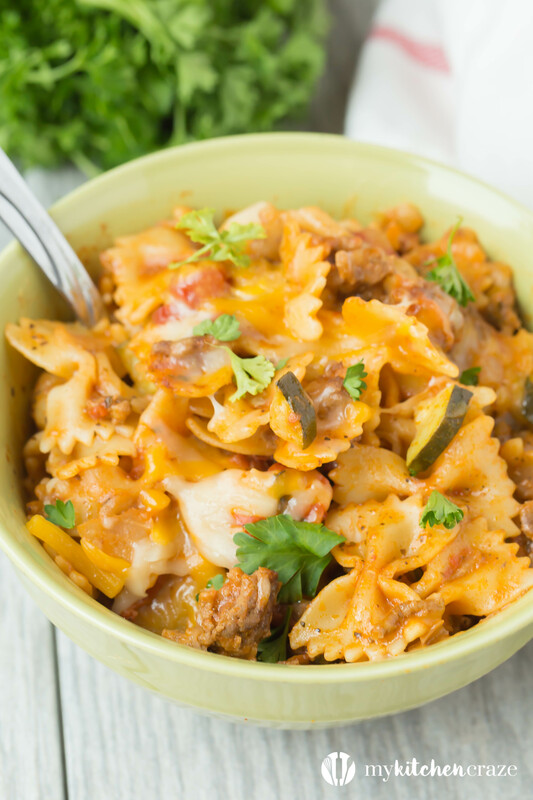 The flavors in this one pan pasta are delicious and taste great for dinner. This meal is part of our weekly rotation now! You should make it part of yours too! Your gonna love it, promise! Also, don’t forget today is 30 Minute Thursday! You all know what that means! 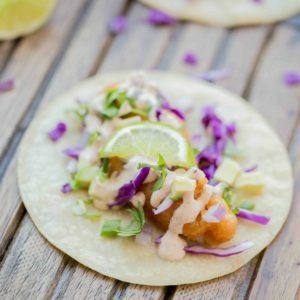 My food blogger friends and I bring you a ton of dinner recipes that are cooked within 30 minutes. Perfect for those days like I had this past weekend or days you’re so busy you can’t even think straight. 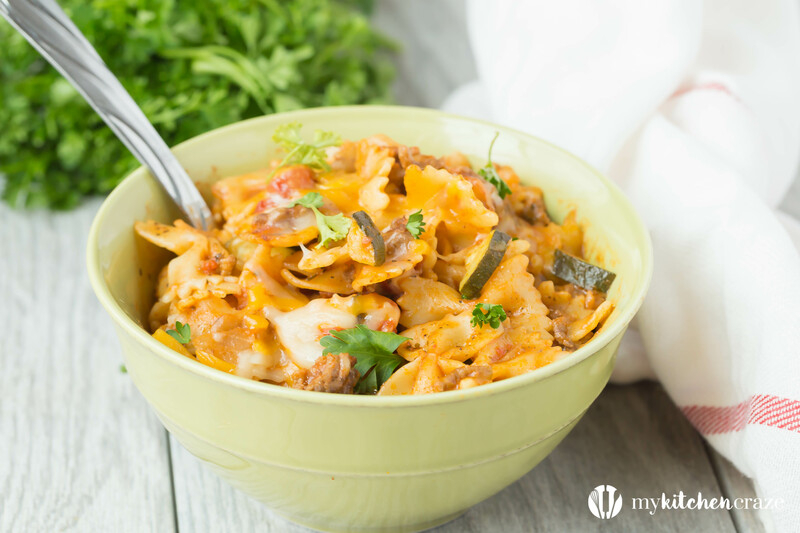 Head over to everyone’s blog to get some yummy recipes! Enjoy! In a large deep skillet, add olive oil over medium heat until hot. Add onions, garlic and meat. Cook until browned, drain and return to skillet. Add tomatoes, broth and water; mix well. Bring to a boil. Add zucchini, tomato paste, parsley, seasoning and pasta. Mix well. Cover, reduce heat to medium. Simmer for 15 minutes; or until pasta is tender. Turn off heat once pasta is tender. Sprinkle with cheese, cover for 4-5 minutes, until cheese is melted. Sheet Pan Chicken Fajitas from Bake.Eat.Repeat. LOVE a good one pot meal! Looks awesome Cyndi! 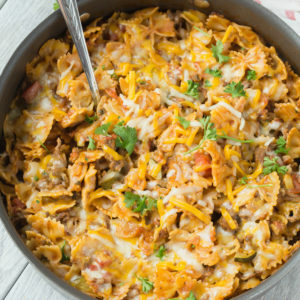 This looks so delicious and I love that it’s made in one pot! I’m totally jealous of your shopping trip, too! I haven’t had a day like that in forever! I love a quick and easy pasta dinner. This sounds perfect! Love your day with your mom too, what a fun memory to have! It was a fun day for sure, Erin. I love pasta dinners too. 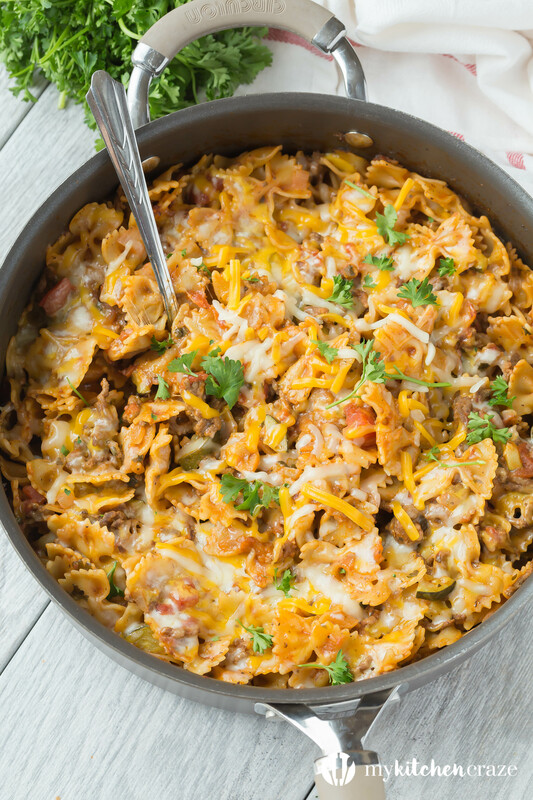 One pan meals are such a life-saver for busy weeknights! I love cooking but don’t like to spend hours in the kitchen after work, so this looks like the perfect meal! Anything with pasta is a winner in my book! 🙂 And what a great idea to add in some ground turkey. Looks so delicious, Cyndi! Thank you Gayle. I heart pasta too. 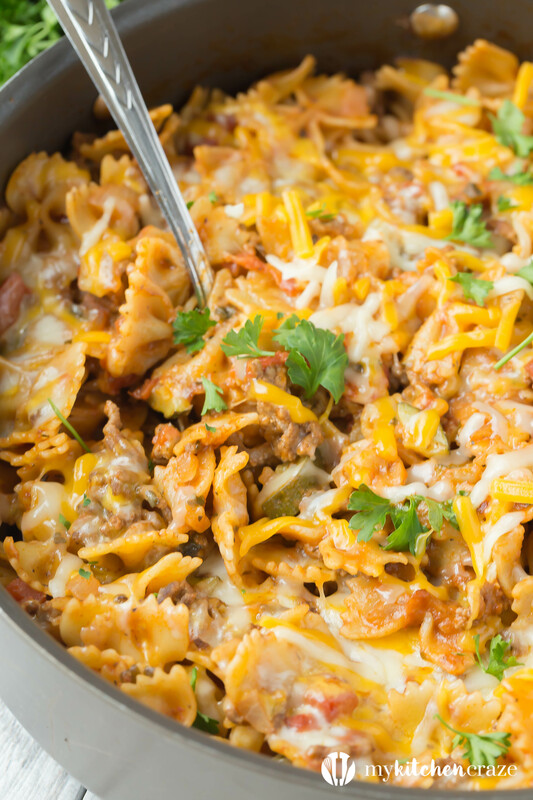 I love pasta and this recipe is very simple and I can make in one pan thanks. Quick and easy meals are the best!! 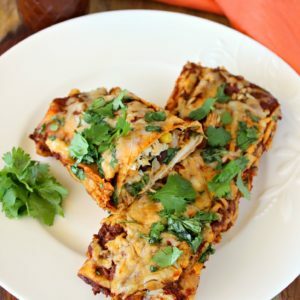 Love the zucchini in this!! I love them too Aimee! Zucchini is my new favorite veggie! I LOVE going shopping with my Mom. It’s something we always did together when I was a kid. And I still love doing it now. But I can only last 2 hours maximum. I get poop! Don’t know how you shopped for 6 hours! Lol. This dish looks like the perfect post-excursion fuel! Shopping with mom is indeed the best. What do girls love more than shopping… ?? Fun and I love your 30 minute Thursday round ups.. Your shopping day sounded like a blast, and shopping is very tiring in my opinion! 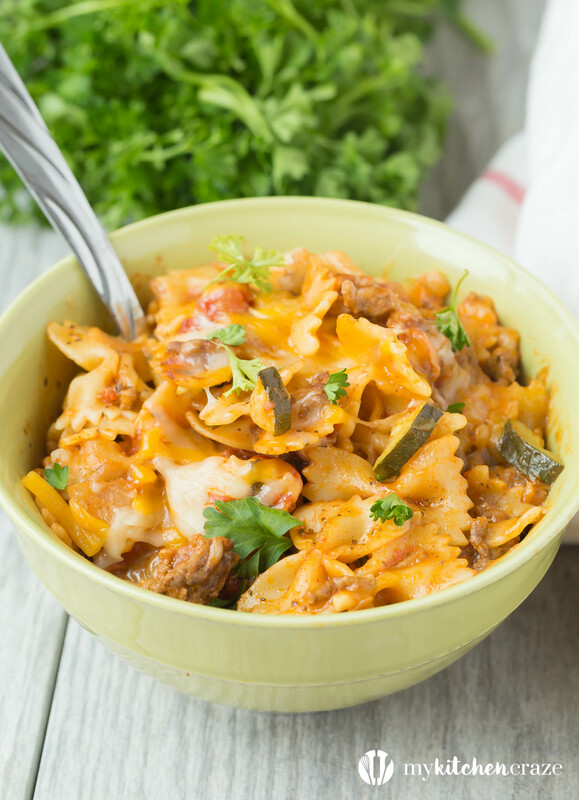 It’s a good thing you came up with this quick, delicious meal to save the day! This would be a big hit with my family! 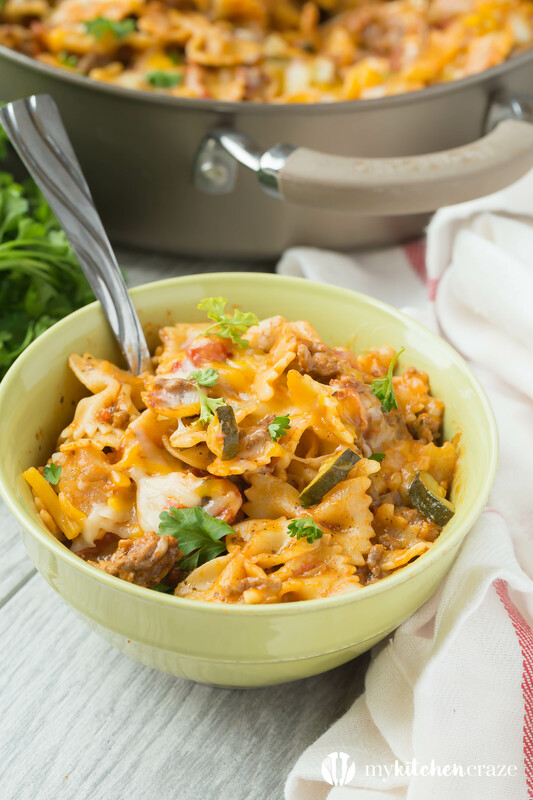 I love quick one pot pasta dishes like this – I need them pretty much on a daily basis during the week, there’s no time to cook! Can’t wait to try this one out!